Light, sound, all systems are GO!! 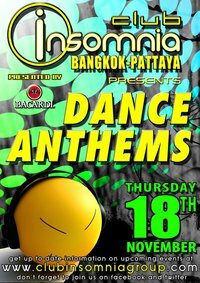 Don’t miss our first Dance Anthem for Insomnia Bangkok! We got our original resident DJ that will blow your mind ranging from all types of music all night. We’re throwing glow sticks in the air and drinking all night. Special promotions for our awesome members and more. So DON’T MISS IT!